Back to Library » Updates about The Atlas & General News » In mayors’ civic tech competition, The Atlas places top 5! Co-Founder of @TheAtlas4Cities. Yes: infrastructure, cities, environment. Also: USMC, real food, women engineers, Rice University. No thanks: running. In mayors’ civic tech competition, The Atlas places top 5! The Atlas finished as a top 5 finalist in the U.S. Conference of Mayor’s civic tech competition. 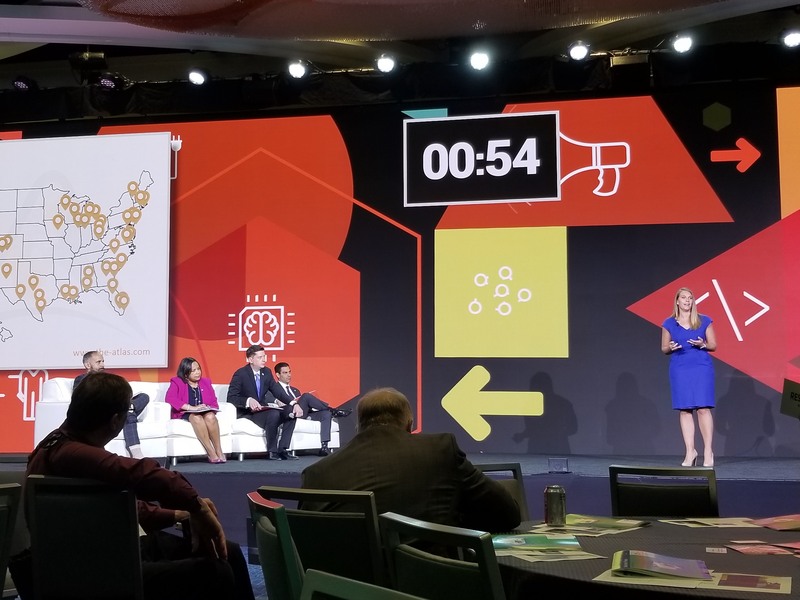 As a top 5 finalist, Elle Hempen (CEO of The Atlas) pitched a panel of mayors and answered Q&A this past weekend at U.S. Conference of Mayors conference in Boston. CEO of The Atlas, Elle Hempen, pitching to a panel of Mayors at U.S. Conference of Mayor’s civic tech competition in Boston. While we didn’t win the overall prize, The Atlas Team is thrilled to be a top 5 finalist and to have had the opportunity to share our work with the more than 250 mayors in attendance this past weekend. -Nathan Armentrout, Founder & CEO, Casper Security – Casper Security improves neighborhood safety by monitoring abandoned properties and alerting neighbors and cities when danger is imminent at a fraction of the cost of demolition. -Elle Hempen, CEO, The Atlas – The Atlas is the online community of public officials and innovators replicating what is working in other communities. -Paul Salama, Chief Evangelist, ClearRoad – ClearRoad is a system that allows for digital per-mile fee collection, a more efficient, fair way to charge for roads. -Noelle Marcus, Co-Founder, Nesterly – Nesterly connects households with spare space to younger people seeking a place to stay. In a twist that’s unique to Nesterly, young people can also exchange help around the house for lower rent. -Joel Mahoney, Co-Founder & CEO, OpenCounter – OpenCounter builds tools for local governments to help streamline service delivery to residents. The portals guide applicants through complex permitting workflows so applicants can understand the full scope of projects before they get started. It was an honor to share the stage with the other 4 finalists – all of the companies have incredible missions and teams – and we’re inspired by their visions for a better world. Perhaps most importantly, though, we’re stoked to take everything we learned this weekend and apply it to helping our 80 partner cities more efficiently R&D (rip-off & duplicate!) what’s working in other cities! There's a brand new version of The Atlas now! Read all about where we've come from, what's new, and why we undertook this massive effort. We’re thrilled to announce that RJ Berry, former mayor of Albuquerque and leader in local government innovation, has joined The Atlas as Senior Advisor. As more cities join and use The Atlas, we gain city insights about infrastructure projects, improving RFP processes, and how cites learn from others.